A traditional Brazilian beverage gets a spicy twist and is lightened up with a secret ingredient. 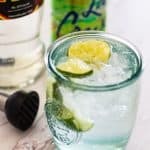 Grab a bottle of Cachaça and switch up your cocktail game with my Spicy Jalapeño Caipirinha Cocktail! This cocktail has a funny name AND an ingredient with a funny name too! Before we start talking about the recipe for the Caipirinha we need to talk about how to pronounce it. Let’s break it down. The “Cai” is pronounced like the Egyptian city of Cairo. “pi” is like a sweet pea. “Rin” sounds like the bird the wren. And the “ha” part sounds like ya! So when you put it together Caipirinha sounds like Cai-Pea-Wren-Ya. Here is a link to click so you can hear it too! How do you pronounce Caipirinha? Now that we have that part covered, what exactly is a Caipirinha? is the ultimate 3 ingredient cocktail! A mixture of fresh limes, muddled with sugar, and mixed with cachaça. 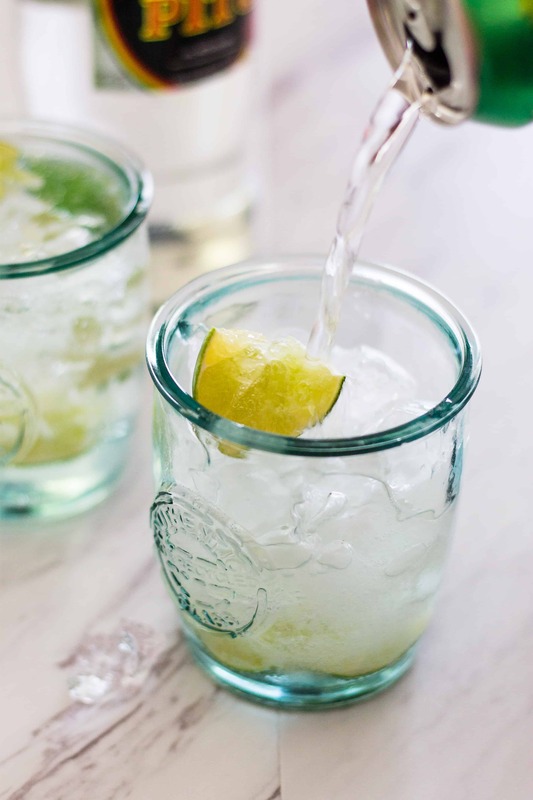 The Caipirinha is a sweet and slightly tart drink meant for sipping that’s for sure. But of course I can’t let anything stand after having a few of the original so let’s switch things up a little! How am I mixing it up? By adding a little heat with some fresh jalapeño. If I am muddling fresh lime, might as well toss in a few slices of fresh jalapeño. 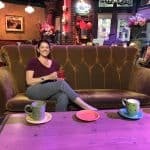 Not in the mood for a spicy beverage, just leave them out. No biggie:) You can also be sneaky and muddle the Jalapeño with the limes but then take out the evidence and share a secretly spicy cocktail to keep your guests on their toes. With so few ingredients in my Spicy Jalapeño Caipirinha, it’s extra important to make sure you have the best quality ingredients! Back to the ingredient with a funny name because it is the star of the Caipirinha! Aside from the lime, alapeño, and sugar, the star is Cachaça! What is Cachaça? Is it a rum? Cachaça is a Brazilian spirit made from fermented sugar cane. Not to be confused with rum which is made from sugar cane, molasses, and then is required to be partially or totally aged. Cachaça doesn’t contain molasses and isn’t required to be aged at all. It can be but doesn’t have to. Like I don’t have to have a few refills but I can! LOL! You could call cachaça a cousin of rum but it has been compared more to a European grappa or brandy. Either way, it’s pretty darn tasty and distinct! Now that you know you need cachaça, you need to be able to ask your spirit store if they carry it. But how do you ask without sounding like a nit-wit? How do you pronounce cachaça? Let’s break it down like before. “Ca” sounds like Ka. The “Cha” sounds like shah. And the ça, with the funny tail or Cedilla, sounds like suh. Ka-Shah-Suh. Boom! Now you can order your cachaça like a pro and get your Caipirinha on! The most popular brand is Pitu and it is usually the only one available in my liquor store so that’s what I use! The key to making a Caipirinha is how you muddle the limes. Because the cocktail is primarily lime juice, Cachaca, and sugar, you have to make sure you get as much lime juice out of the lime wedges as possible. Start with a sturdy glass! I love these but use what you have, just not a flimsy wine glass. You are going to be man-handling these limes so your glass needs to be able to take it. Make sure you have a really good and sturdy muddler! I have used the pestle from my mortar and pestle set but not as effective. Get a muddler with spikes on the bottom or make some extra slices into the lime peel before you start smashing. Sprinkling the sugar over the lime quarters/wedges help to tear into the flesh of the lime which is why I prefer regular granulated or turbinado sugar instead of the traditional superfine sugar. Once you muddle the lime wedges and sugar, add cachaça and ice. Normally you would stir, and garnish with a slice of lime but I top mine with sparkling water much like my Blackberry Coconut Smash. 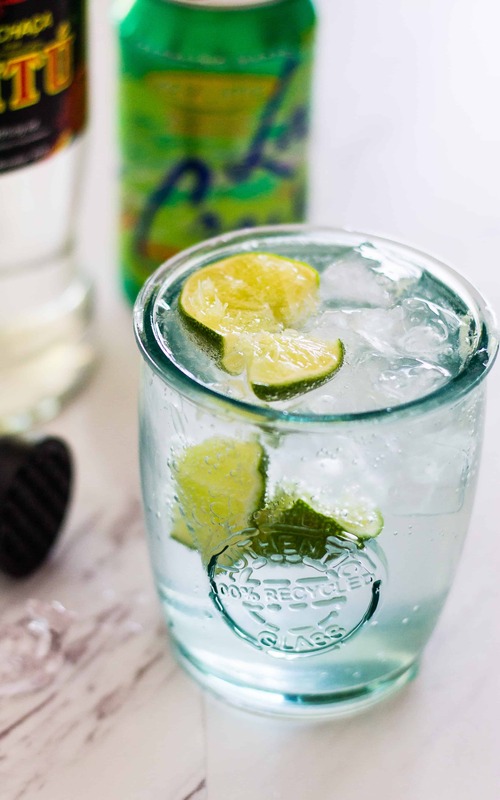 I prefer a lime-flavored water one to enhance the lime and my new fave is Key Lime flavor. It adds a little sweetness to it, much like a Meyer Lemon adds a little more oomph than a regular lemon. Garnish with a lime wedge, mint leaf, or slice of jalapeño and start sipping. Summer isn’t getting any cooler! Other delicious cachaça cocktails to try! Now that you have that bottle of Cachaça you can’t let it go to waste. Check out these other delicious beverages to make! If you love trying regional cocktails, give this crisp and Spicy Jalapeno Caipirhina Cocktail! 5 ingredients are all you need for this easy and skinny cocktail recipe! A traditional Brazilian beverage gets a spicy twist and is lightened up with a secret ingredient. 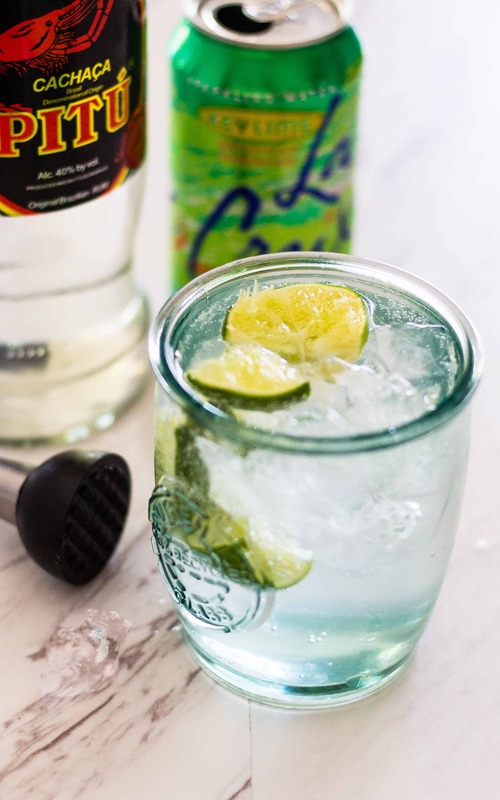 Grab a bottle of Cachaça and switch up your cocktail game with my Spicy Jalapeño Caipirinha Cocktail. Start with 2 cocktail glasses. 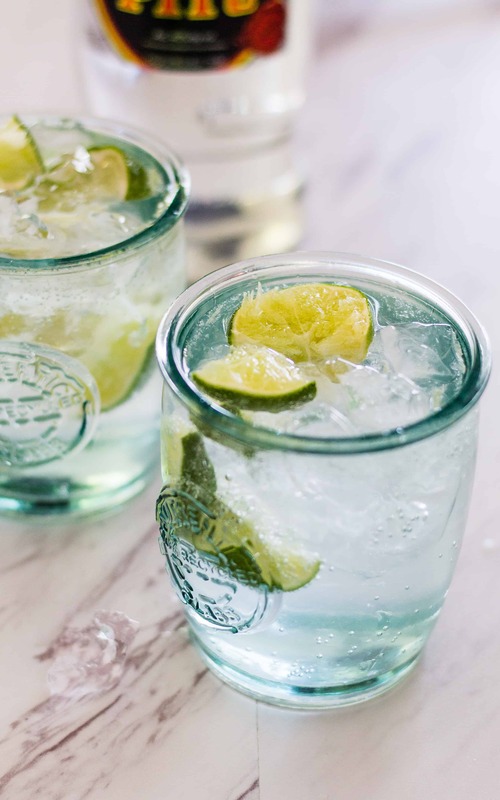 Place the lime quarters in the glasses (1 whole lime per glass). If you want your Spicy Jalapeño Caipirinha spicy, add 2 jalapeño slices to each glass. If you want a regular Caipirinha, leave out the jalapeño. Sprinkle the lime quarters (and jalapeño) with a 1 tablespoon of sugar. 1 tablespoon per glass. 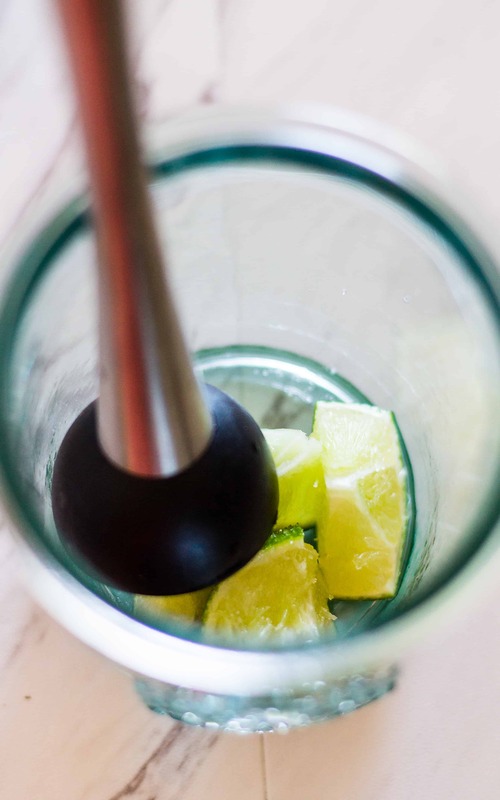 Muddle the limes until most of the juice is released and the sugar is dissolved. Add 3 ounces of Cachaça to each glass. Stir to combine with the muddled juices. Pour the sparkling water over the ice to fill each glass. I love anything with lime and jalapeno! Perfect for cocktails!